64 year old Chairman of the Board John W. Kaufman and his fellow B.P.O.E. Lodge No. 37 trustees had regretfully concluded that the loss of the clubhouse, coupled with declining membership levels, rendered the lodge's retention of the golf course and property untenable. But, how could the trustees obtain relief from this financial burden (let alone the expense of reconstructing the burned down clubhouse), while still ensuring that the 180 remaining golfing Elks could still play the golf course as members of a private club? An answer had to be found fast or the unsettling lack of certainty would drive away remaining golfers, the staff, and the coming Ohio Amateur Championship. Kaufman had personal reasons for wanting the course to survive. After all, it was he who had engineered the lodge's (1) purchase of the 265 acre Higgins property, (2) building of its Donald Ross- designed golf course, and (3) operation of its own country club. While a number of potential buyers expressed interest in purchasing the grounds, it is a good bet that John W. shuddered at the prospect that some fast- talking developer might wind up with the property and proceed to destroy the beautiful golf course he and his Elks had built. How could he help solve the B.P.O.E. 's dilemma? Kaufman was in the best position of anyone to effect the friendly bail-out of the lodge and its golfers. Unlike most folks in 1931, the Kaufman family still had money. So, either at the behest of his fellow trustees or his own initiative, John W. decided to step up. 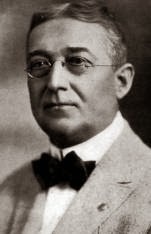 He orchestrated an offer by "The Glen Burn Company," to purchase the entire club property from the B.P.O.E.. "The Glen Burn Company," was a real estate entity comprised of John W., his son Harold, and son-in-law Oscar "Dutch" Altmaier. The details of the transaction were related to the membership by John W. at the February 11 meeting of the lodge. He explained that Elks who were currently members of the soon to be disbanded Elks' Country Club would form a new golf club. Glen Burn, after taking ownership, would lease the property back to the new club for an indefinite period. John W. realized that finances would be tight for the fledgling club, so to assist it in getting off to a good start, "...no rent would be charged for the first two years and that then a nominal rent would be agreed upon which would allow the [newly formed] club to continue, as it [meaning the Elks' Country Club] has in the past, as a course where golfers of moderate means would not find dues beyond their reach." John W. also formed an "organizing committee" of Elks' members who would be entrusted with running the new club. The committee was to be headed by the affable Elks' green committee chairman Tom Dempsey. He would become the new club's general manager. John W. also appointed Henry Watkins and J.F. Powers to the organizing committee. It might have seemed a bit unusual for landlord John W. to be the one appointing his new tenant's management team. However, it would have made no sense for John W. to go to the trouble of helping his fellow Elks out of a financial jam unless he could be assured of excellent rapport with the new club's representatives. Although John W. balked at having The Glen Burn Company incur the expense of rebuilding the clubhouse, he proposed spending $15,000 on infrastructure improvements. These would include a new women's locker room, a new dining room adjacent to the present men's locker house, and resurfacing of the road leading to the locker room. Another $10,000 would be expended by Glen Burn on course improvements. New man in charge Tom Dempsey provided additional details pertaining to the new club at the lodge meeting. He explained to the assemblage that a membership committee would be named to "restrict membership, although the new club is expected to absorb most of the members of the old Elks' Country Club." The new club would not be restricted to the members of B.P.O.E., and welcomed applications from outside Elks' ranks. The club would be operated solely as a golf club with "no provision made for dances or any other kind of parties usually associated with a country club." The initiation fee would be set at a mere $25 with an annual membership fee in the amount of $75. The fees would be increased once the roster reached 200. The number of men's memberships would be closed once the number reached 250. Dempsey felt this number would be reached easily "as most of the present membership is expected to remain and that many local golfers who had been kept out by limitation to Elks' members would now be recruited." Memberships for women would be available as well. Work would start immediately on the improvements mentioned by Mr. Kaufman. Dempsey also reassured attendees that professional Francis Marzolf, greenkeeper Lawrence Huber, and locker room attendant Frank Whipp would continue in the service of the new club. Dempsey advised that a new name for the club would be selected in the near future. The name would be "entirely divorced from either The Elks' or Glen Burn, under which names the club has been designated in the past." (I would note that at no time in my research did I see the club or course referred to as "Glen Burn" until the Dempsey comments of February 11, 1931 were reported in the next day's newspapers). Dempsey reported that he had contacted the Ohio Golf Association, and informed its officials that the new club would be ready for the Ohio Amateur "in plenty of time." Lawrence Huber had already manured the fairways, construction work had already been started, and he was confident that the links "will be in better shape than ever during the coming year." into residence at the Franklin County Home. It had to cross the minds of the many who loved and admired Bill Moose that the course's new name should also be interpreted as a personal tribute to him. Certainly the image of the native American on the scorecard bore a resemblance to Bill. Wyandot- scorecard- note the "stymie gauge"
Wyandot's new general manager Dempsey was extended good wishes by The Citizen's sportswriter Lew Byrer, who penned, "With Tom Dempsey, as fine a guy as Columbus golf knows, at its head, the new organization should prosper and become, in the future, an even greater factor in Columbus golf than in the past." Dempsey and his fellow organizing committee member Henry Watkins were no doubt pleased to be working in harness together. Best friends Tom and Henry played golf together two to three times weekly. Forever locked in a never-ending battle for bragging rights, the two high 80's shooters began keeping a cumulative tally of who had won more holes over their hundreds of matches. 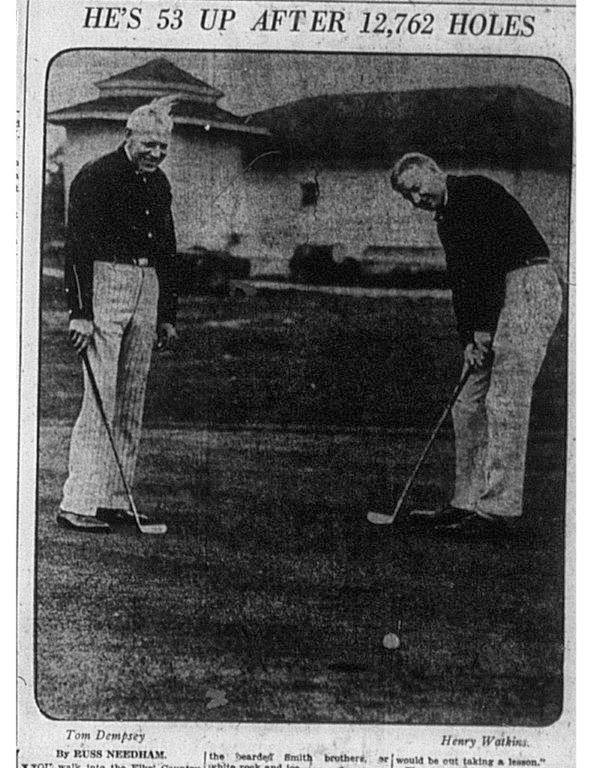 A Bill Needham- authored feature in the May 23, 1930 Columbus Citizen indicated that Dempsey was currently holding a 53 up lead after 12,762 holes! After each round, the winner of the day's match would proudly hang a red flag from his locker as a symbol of victory. Though it seems counterintuitive, each golf season's cumulative winner hosted the other fellow and his family for dinner. Henry Watkins enjoyed telling the story of the fishing trip he took to Minnesota. Communication with the outside world from his remote camp was none too good. Let Henry take over the tale. "One day I received a telephone call from the telegram office. It was a wire from Dempsey. I asked the office to read it to me. 'Went crazy and shot....,' the girl read and at that point the telephone wire broke down. I didn't know what sort of tragedy had happened to my friend. So I walked half a mile down the road to the closest phone to hear the rest of the telegram. It consisted of two words. They were 'an 85.' "
Dempsey plunged into the effort to recruit members for Wyandot. Applicants, whether members of the now disbanded Elks' Country Club or newcomers unaffiliated with the B.P.O.E., were asked to pony up a $25 initiation fee in addition to the $75 annual subscription. By March 27th, Dempsey had succeeded in signing up 170 members. But he did not convince all the former Elks' members to transfer their membership to Wyandot. He was unable to coax three key members of The Elks' golf team into the Wyandot fold. George Babcock, Max Matusoff, and Eddie Hart had moved on. Even Johnny Florio considered playing his golf elsewhere. 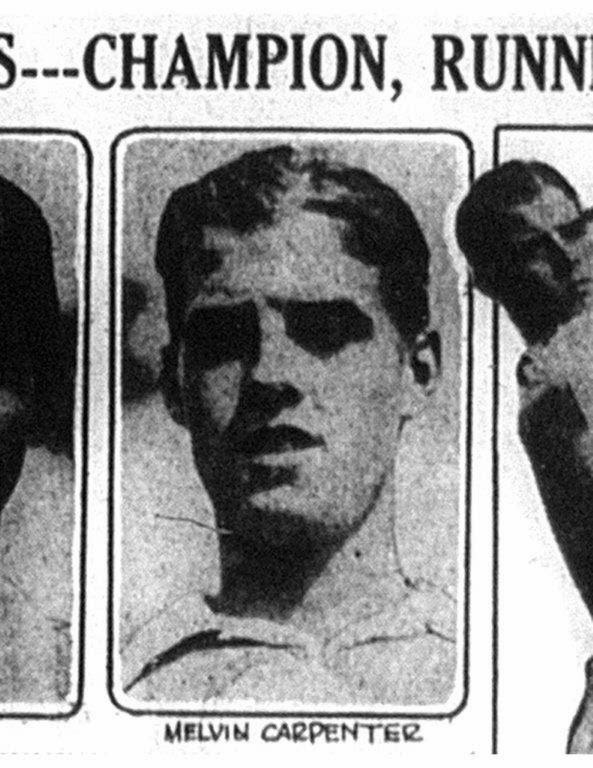 Melvin Carpenter, who had won the Columbus District Junior championship under the Elks' banner, was gone too having joined the professional ranks. These roadblocks caused Dempsey to redouble his membership drive efforts. One way to grab the attention of prospective members was to publicize the constant buzz of activity that Wyandot maintained throughout the spring. Construction of the new ladies' locker room and lounge moved along expeditiously. It was remarked in the Dispatch sports page that the ladies would have use of a facility "equipped with two marble shower rooms, four individual dressing rooms, with the floor of rose and blue tile." The Ohio State Journal's E. H. Peniston gave two-thumbs-up to the refurbished and reorganized men's locker room. "Twenty rooms will be provided, patterned after the Columbus Country Club. A table and six chairs will be found in each separate compartment." Peniston adjudged that "the new setup modeled after Tom's idea, is great and a big improvement." Francis Marzolf's pro shop and the caddy master's station were redecorated too. Improvements to the course were also in process. The ninth and eighteenth tees were elevated. Brush and trees to the right of the first hole were eliminated. Peniston was wowed by the course's beauty that spring. "All the dogwood, red-bud, and other flowering trees and shrubs as well as the course, are at their best at Wyandot now, and worth a trip to see in themselves." Another Dempsey brainchild was to place rakes (cheap ones to discourage theft) at each of Wyandot's 126 traps. Peniston approved of this new innovation, and suggested that other Columbus courses follow suit because, "it is a big help and doubtless helps cut down trap cussing to a minimum at Wyandot." Dempsey and the rest of the Wyandot braintrust waited anxiously for word on whether the Ohio Golf Association would change the location of the Ohio Amateur scheduled for July 6th. Having been spooked by the turmoil engulfing Elks'-Wyandot, the OGA required satisfaction that Dempsey and his team would have a well-maintained course and adequate facilities. He must have succeeded because on April 11th, the OGA's secretary put an end to the speculation and announced that Wyandot would retain the championship. The OGA's F.S. Crooks mentioned that he would be meeting shortly with Dempsey to work out the plans for the event. It was definitely a major coup for Wyandot to become the first club to host the Ohio Open and Ohio Amateur in back-to-back years. 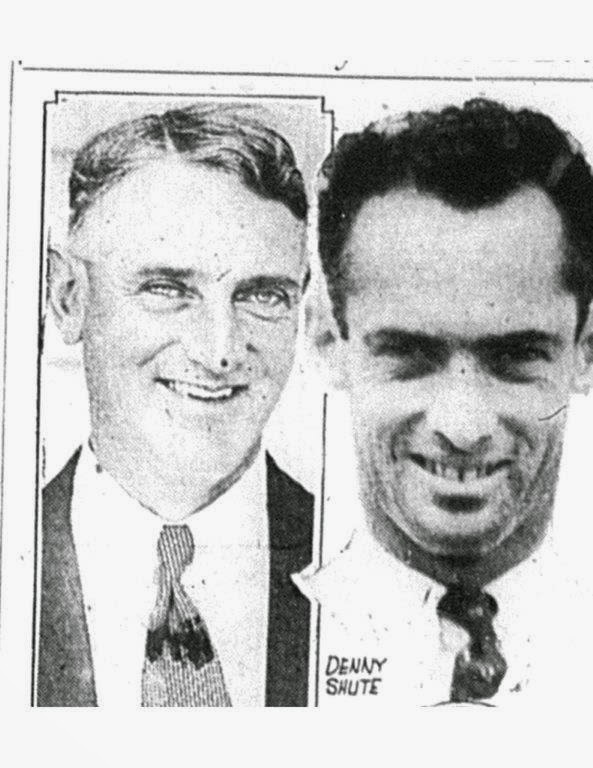 Dempsey and company had to be delighted that Wyandot would be hosting the last leg of four spectacular golf events to be held in the Buckeye State over the period from June 19 to July 10, 1931, Preceding the state amateur would be (1) the prestigious Western Open at Miami Valley in Dayton; (2) the Ryder Cup team competition staged at Columbus's Scioto, and (3) the United States Open to be contested at Toledo's Inverness. Columbus golf fans and Wyandot members anticipated that their local star and Elks' alum Denny Shute would be inspired to play well in front of the home crowd at the Ryder Cup. Unfortunately, there was no guarantee Denny would make the team. He had failed to earn one of its 10 automatic berths. But he would have one last opportunity to join the U.S. side. A 72 hole qualifier would be contested at Scioto immediately prior to the start of Ryder Cup play. A committee of the PGA had selected 13 players including Denny to fight it out for the last two berths. From all accounts, Denny Shute enjoyed the recognition he had earned in his adopted home of Columbus as its leading sports star and Elks'- Wyandot's favorite son. He also seemed happy with his affiliation at Brookside in Columbus where he served as a co-professional with his father Hermon. But those good feelings only made things more complicated when Lake Forest Country Club in Hudson, Ohio, 150 miles distant from Columbus, began romancing Denny in March, 1931. The rumor circulated that Lake Forest had made him a very lucrative offer. The Hudson club supposedly had big plans: the club was a major part of an ambitious real estate development that was just getting started. Luring a name like Denny to Lake Forest would certainly boost sales. Denny was apparently blown away by the club's promises, and he explored what seemed like a can't miss opportunity. However, there was a fly in the ointment. Denny was still under contract to Brookside! Thus on March 22nd, the Ohio State Journal reported, "Denny Shute will be back at Brookside, it was stated by Brookside officials Saturday. The rumor that he might go to Cleveland [which is near Hudson] is unfounded for he has signed a contract to remain here." There must have been some serious wheelin' and dealin' subsequent to March 22nd because one week later it was announced that Denny had accepted the Lake Forest job and would be leaving Columbus. Furthermore, Brookside had decided to let him go. 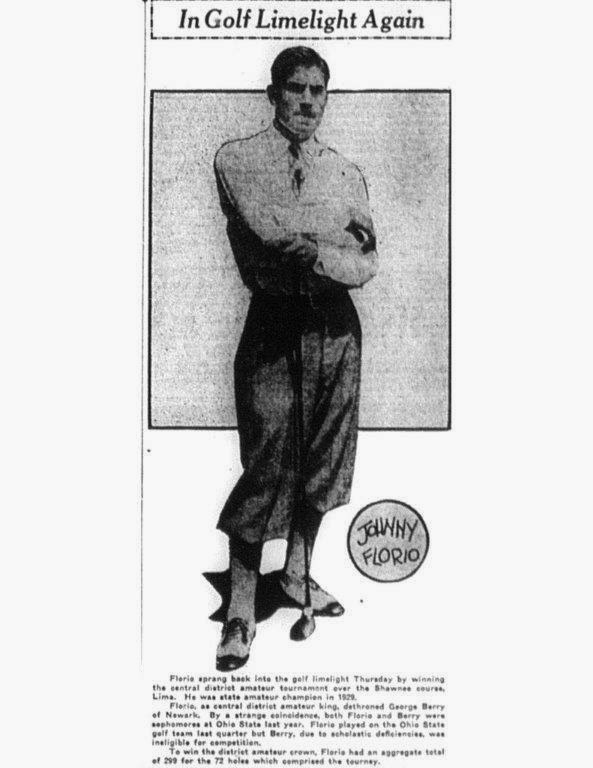 The Dispatch piece noted that "...Shute, now at Pinehurst, N.C. [competing in the North and South Open], wired J.S. McVey [Brookside club president] recently asking if he could be released from any contract, verbal or written, and the Brookside management replied that it was entirely up to Denny whether he wanted to remain in Columbus or go elsewhere." McVey put the best face on Denny's departure from the club's perspective. He stated it would not be necessary to replace the sharpshooter because "Hermon Shute, who is now on the job, will handle the whole professional's burden at the club." The arrangement with Denny had been such that he had been allowed to spend most of his time away from the club in competitions anyway. Before leaving town for good, Denny made the rounds in Columbus to say goodbye to his golfing friends. He expressed appreciation for the "marvelous treatment" he had received from Brookside officials and the Columbus public. He would have stayed in town, but Lake Forest had made him an offer he "did not feel he could refuse." Elks'-Wyandot's greatest golf alum probably wondered whether he would be well received by Columbus golf fans when he would soon mount his effort to qualify for the U.S. Ryder cup side at Scioto. If so, he needn't have worried. Denny would be warmly welcomed and still acclaimed as a "home boy" by everyone at the Ryder Cup. Shute's departure was just one more indicator that "times were a-changin' " for the former Elks' Country Club members. They were being solicited to join a much different club than the one which they had been affiliated with in the Roaring 20's. The big dances and formal social occasions held in the now vanished clubhouse were all in the past. People with no B.P.O.E. connection would be joining. 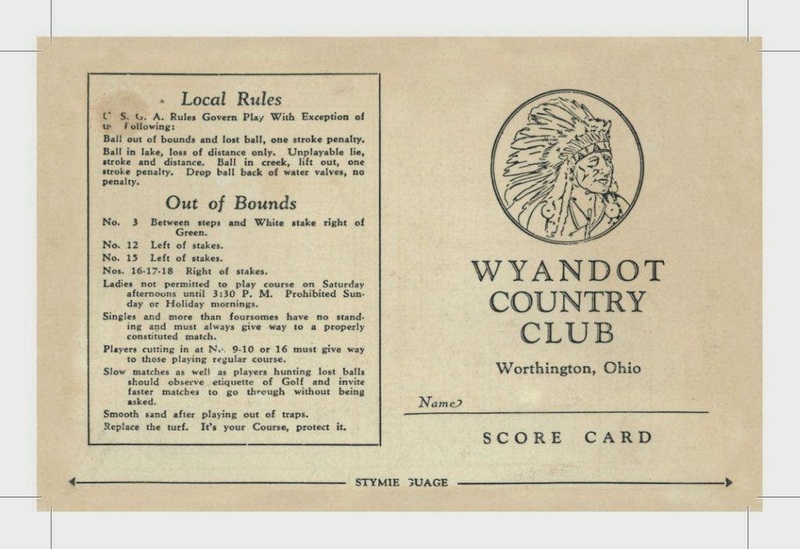 Wyandot was repositioning itself as a moderately priced golf-only club instead of competing with full- amenities upscale clubs like Scioto and Columbus. But eventually Dempsey was successful in persuading most of the old guard to join. Wyandot was working its way "out of the ashes" to a successful new beginning. Johnny Florio overcame his reservations and signed up. Despite the loss of several regulars, any golf team featuring the one-two punch of Ohio Amateur champions Florio and Glen Bishop was going to be formidable. The Wyandot golf team showed it still could take on all comers in the Ohio State Journal team competition held on June 4th at Wyandot. The match with always-tough Scioto was deadlocked at 28 points when the final game of the day between Wyandot's W.E. Lynch and Scioto's Curtis Sohl reached the 18th all square. Realizing the outcome of the match rested on the shoulders of Messrs. Lynch and Sohl, members of both teams and other interested onlookers crowded behind the 18th green to cheer their boys. To the delight of the home faithful, Lynch's third shot from the rough crept close to the pin thereby securing a thrilling Wyandot victory over its dejected rival. This victory was the start of what would be an amazing stretch of golf for central Ohio golf fans and Wyandot's players in particular. First, Johnny Florio promptly followed up the team's big win by emerging victorious in the Central Ohio Amateur at Shawnee Country Club in Lima. Johnny had already enjoyed success in 1931 as a junior star on the George Sargent coached Ohio State golf team. Florio won his way to the semi-finals of the NCAA golf championship where he was bested by OSU teammate Bob Kepler. Just prior to that good showing, Johnny managed to make the cut competing against the top tour pros in the Western Open. Given his good form and the fact he would be competing on his home track, the scribes established Johnny as the clear favorite to stretch the amazing Elks'-Wyandot string of Ohio Amateur wins to five straight. But before the Amateur would be contested, there were two other golf events of global significance to take place in Ohio- the Ryder Cup at Scioto (preceded by the U.S team qualifier in which Denny Shute would be participating), and the United States Open at Toledo's Inverness. What a smorgasbord of golf !